Recent evidence suggests that the Yellowstone hotspot is a long-lived feature that that resided offshore to produce the Siletzia oceanic plateau in Paleocene to Eocene time. Farallon-plate subduction resulted in collision and accretion of Siletzia at 50 Ma, and overriding of the hotspot by about 42 Ma (Wells et al., 2014). 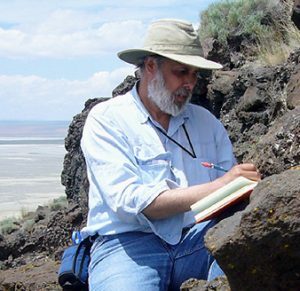 I will discuss in this talk how the Yellowstone hotspot was manifested in eastern Oregon in late Oligocene to early Miocene time, before generation of the Columbia River flood basalts and the Snake River Plain hotspot track. Field relationships, together with new and compiled geochemical and geochronological data reveal a broadening of the southern segment of the ancestral Cascades arc into the Oregon back-arc region from 30-20 Ma. This period of volcanism generated rocks with elevated LILE/HFSE values and depleted Nb concentrations, consistent with a hydrated and metasomatized mantle source enriched in the water soluble elements Rb, Ba, K and Pb. We attribute this event to thermal uplift of the Farallon slab by the Yellowstone mantle plume, with heat diffusion, decompression and the release of volatiles promoting high-K calc-alkaline volcanism throughout the Oregon back-arc region. A significant number of the 30-20 Ma outcrops in southern Oregon, northern Nevada, and southwestern Idaho are dominated by andesitic lavas with high Sr/Y values consistent with adakites derived from the melting of oceanic crust, or from combined oceanic crust and mantle sources. These outcrops define a broad area of northeast trend parallel to plate motion, mid-way between the two hypothetical Yellowstone hotspot tracks of Wells et al. (2014). We conclude that this ~30-20 Ma adakite trend derives from the melting of oceanic crust from the Farallon slab lying above the Yellowstone plume tail. We consider this trend to be an older extension of the Yellowstone-Snake River Plain hotspot track. Continued uplift resulted in a volcanic hiatus that began at 22-20 Ma, but ended at 16.7 Ma with coeval rupture of the uplifted slab in two separate places. The eastern rupture resulted in the eruption of Steens Basalt derived from the ascent of a dry mantle-plume source contaminated with depleted mantle. The western rupture resulted in the contemporaneous rejuvenation of high-K calc-alkaline volcanism due to renewed subduction and melting of a wet mantle source restricted to the Nevada-California border region. Since that time, the southern segment of the ancestral Cascades arc has migrated to the west at 7.8 km/m.y. Destruction of the slab is evident today in the resolution of a seismic hole beneath southern Oregon that is bound on the south by the Yellowstone adakite hotspot track. Its demise is the combined result of a long-lived sequence of thermal erosion, rapid tearing, and the foundering of slab segments from 30-10 Ma.